Finally! 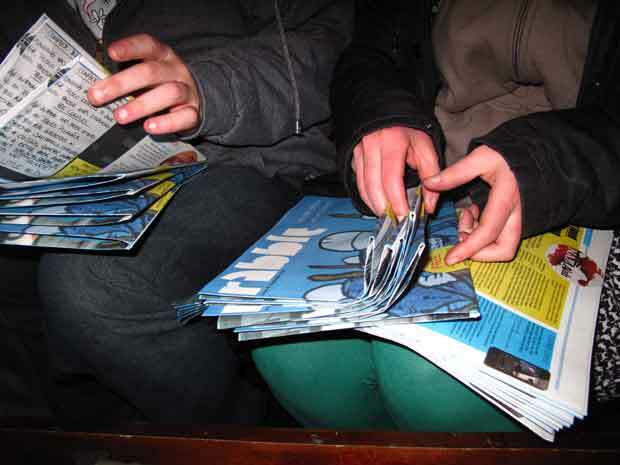 A few thousand copies of a magazine called rabble landed in Dublin last night. Over the weekend we will be arranging distribution in the city centre. Expect it to appear in all of the usual places and hopefully some you wouldn’t expect. A list of pick up points will go online over the next few days. Good stuff lads, let the virus spread. Looking forward to this merchandise you speak of. Nice one Mickey, the donation was recieved and is much appreciated. Did you manage to pick up some copies? im spreading thru the old reliable word of mouth! i can more genuinely express my liking of your new paper that way!